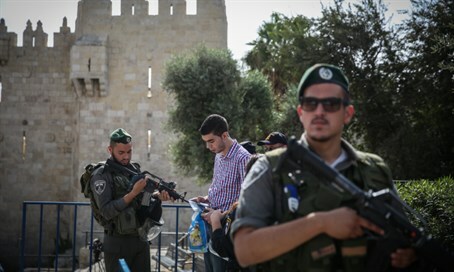 Teen terror cell of 12-14 year olds caught with knives, had planned stabbing at Damascus Gate. Border Police officers arrested four Arab teens on Thursday, after they were spotted near the entrance to Shuafat in Jerusalem wearing the same clothing and engaging in suspicious activity. A 14 year-old boy wearing a pink shirt and carrying a backpack rendezvoused with three others - one of whom was dressed identically - at a strategic traffic circle Thursday afternoon. Two of the teens, who were not dressed in the shirt, were closely observing security forces. The 14 year-old was seen giving his 12.5 year-old "twin" the bag as they passed, and the four began advancing toward the center of Jerusalem. Inside the bag was a false identity, as one of the teens was supposed to be under house arrest for previous terror activity. The police swooped in as soon as the suspicious transfer was completed, and found two large knives in the bag. All four teens were between the ages of 12-14; one, a 14 year-old who fled the scene and was arrested Friday morning, is the relative of one of the terrorists who carried out one of the many stabbing attacks in Jerusalem this month. The four were planning a terror attack at Damascus Gate. "The operational vigilance of the police led to the identification and seizure of a terror cell carrying knives for a stabbing attack," Superintendent Sharon Tadhiya stated Friday. "The police are working in a variety of tasks and events in order and are able to maintain alertness and vigilance of the highest order." "Professional activity and determination of the officers prevented damage to the security forces and innocent civilians," Chief Superintendent of the northern Jerusalem district police, Golan Sharoni, stated. "We are witnessing the involvement of minors in riots and terror and I urge parents who are parents to shoulder their responsibilities and to maintain vigilance towards their children and their behavior."